A few years ago we were asked to do an interesting translation for a small local museum in Germany which was applying to the Getty Museum for funding for some restoration projects. It wasn't an area that I was deeply familiar with, but I've haunted museums all my life, and I was particularly fond of the artist whose work was the subject of the project, so we took the job on with great anticipation. However, it quickly became apparent that ordinary reference resources and information available on the Internet were deeply inadequate for the task ahead. The chemical side of the text wasn't an issue, but the special vocabulary of the world of art conservation/restoration was not easy to discover. Fortunately I had a few connections. My favorite professor from college days, a specialist for organic chemistry, was a scientific advisor to the Getty Museum who helped to establish its conservation institute after his retirement in the 1980's. I contacted him to ask if he could question his acquaintances at the Getty and find out if they had terminology resources available. 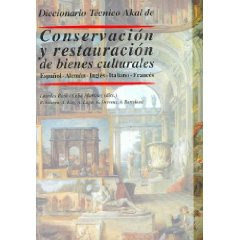 They recommended the Diccionario Tecnico Akal De Conservacion Y Restauracion De Bienes Culturales: Espanol-aleman-ingles-italiano-frances, which was fairly new at the time and not so easy to get. We managed to acquire a copy, which helped us enormously in the project. In the meantime I can find the dictionary at a reasonable price on Amazon. Don't let the Spanish title scare you off; it's perfectly easy to use for persons competent in German, French, Italian or English as well.